For the first time in decades, Scotland was among the favourites to win the 6 Nations championship. Scotland had an amazing November series; beating Australia and Samoa while losing narrowly to New Zealand. Wales had a horrific injury list which ruled out 12 players, including 8 British and Irish Lions. With the likes of Rhys Webb, Dan Biggar and Liam Williams out, Wales were the underdogs. 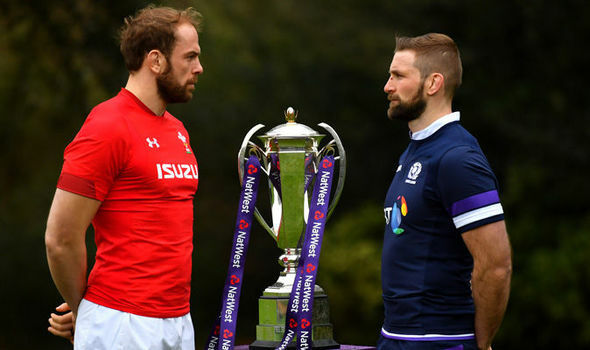 Scotland beat Wales for the first time in a decade last year, and this year they were looking to kick off their 2018 with a first win in Cardiff since 2002. The atmosphere in the Principality Stadium was tremendous. The loud singing and chanting caused my seat to vibrate and my ears to ring. There is always a fantastic atmosphere during the 6 nations, especially in Cardiff. 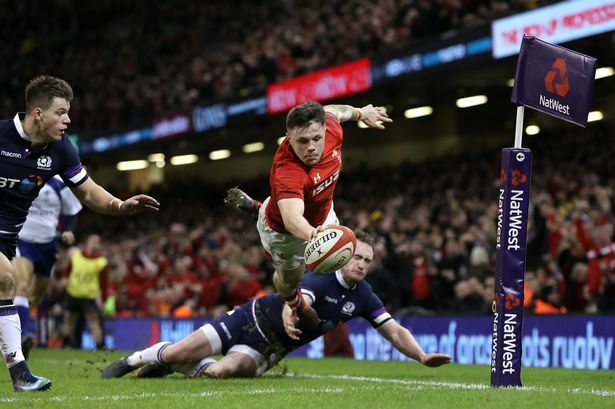 The Scots have recently been known to be the great entertainers of rugby because of their attacking flair, but they found it very hard to break through the rock-solid Welsh defence. In fact, they didn’t manage to get any points until the last minute. Wales’ attack on the other hand, was dazzling. The beginning of this game was incredibly energetic. Both teams were exploiting gaps in each other’s defences and running the length of the field. Gareth Davies intercepted a poor pass from Ali Price and ran 70 meters to dive over the try line in the sixth minute. Halfpenny added the extras and Wales had a 7 point lead. 2 minutes after this came another great Welsh move. 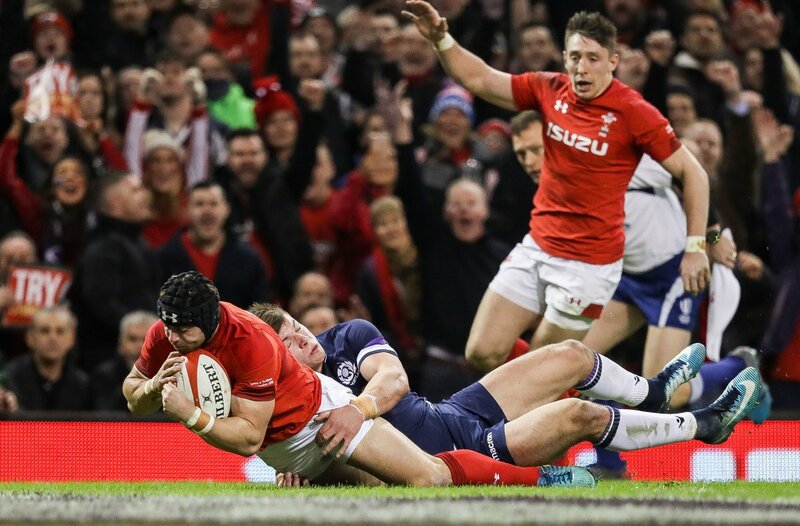 Aaron Shingler broke through the Scottish defence and with some great passing; Wales found themselves meters away from crossing for the second try of the game but were denied by a knock-on near the try-line by Steff Evans. Halfpenny crossed for the second try of the game in the eleventh minute. It was his first try for Wales in five years. He converted his own try from a tough angle and the score was 14-0 to the home team. These early stages left the crowd breathless. The rest of the first half remained as exciting as the first 10 minutes but no points were scored. Penalties were given to Wales in the second and seventh minutes of the second half which Halfpenny converted easily. The score was extended to 20 points with half an hour to go – a mountain for Scotland climb. Leigh Halfpenny scored his second try of the match in the 60th minute and kicked the conversion. Wales needed one more try to get the bonus point. Wyn Jones nearly crossed for his first Welsh try and a bonus point after an incredible run, but it wasn’t awarded because there was no clear grounding. The bonus point did come in the last ten minutes when Steffan Evans grounded the ball with style in the corner. The move started with a great run from Hadleigh Parkes who released Evans. Peter Horne gave something for Scotland to cheer about at the end as he crossed for a cheap consolation try. Considering how many of the Welsh players were missing, this was a brilliant performance from Wales. In my opinion, this was one of Wales’ best performances in two years. Wales were very good defensively and capitalised on Scotland’s common mistakes. It was a very disappointing performance from Scotland’s point of view. Most people expected it to be one of the closest games of the championship but Wales dominated throughout. Scotland was very poor at the breakdown and made many handling errors which constantly gave possession to Wales. The top performers for Wales were Shingler and Halfpenny. Leigh Halfpenny scored his first try 38 games for Wales. He kicked six out of six of his kicks, scored 24 points, and was very good defensively too. It’s fair to say that the Wales team, that included 10 Scarlets, surprised everyone. The final score was 34-7 to Wales. Next week, Wales will head to Twickenham to face the title favourites: England.